Get rid of things that no longer work for you. A few saved recipes from the past = precious mementos. A huge collection = overwhelming clutter. On Thursday, I spent most of the day going through every drawer, every shelf, every binder, and every file folder in my office at work. It was a Purge Party. Amazing, what I found hidden out of sight in my file folders, drawers, & binders. Old, irrelevant, no longer useful papers, manuals, memos, statistics, & computer discs galore! Here's the reason for the Thursday purge. Next week we're getting brand-new carpeting in the library. All the furniture and cubicle dividers will be dismantled--and moved out--to make way for new carpeting. But, before any of this can happen, all of us had to pack up every single thing in our offices (correction: cubicles). And there's no way I was going to pack up all that useless stuff. We brought in a giant paper recycling dumpster, and I purged, baby! It felt fantastic to unload that useless clutter. And it was so much fun. Friday was my day off. I had a long list of things on my To-Do List--and none of them were remotely close to organizing recipes, or purging home files. Are you kidding me? After Thursday's office purge, I had had enough of that for awhile. But, that's exactly what my Friday turned into. When I returned home from exercising & errands on Friday morning, I found my husband in the middle of a Clean, Purge, & Organize Mission! Be careful what you wish for, is all I have to say. My Husband: "That pile of stuff on the kitchen island--that's all of your papers, recipes, and things. I've already thrown out all the obvious garbage stuff that was on the shelves. So please go through your stuff--decide what you want to keep--or throw it out. I can't do anymore here until you go through that stuff." I kept my mouth shut. Trust me--there was no way I wanted to go through those piles--right then--at that moment--but I can't stand clutter on my kitchen island. It had to be dealt with right away. This was stuff I've looked through before--stuff I hadn't been quite ready to part with in the past. Ugh. But, I definitely didn't want to be the roadblock to my husband's cleaning & organizing mission. So, I carefully went through the pile on the kitchen island. My mom's last wallet, with her driver's license, little notes, membership cards. Two giant notebooks & a file box filled with non-medical newspaper clippings, inspirational stuff, articles worth saving, how-to information (like how to hang a picture), business cards, records of past home-improvement projects, what's planted in our garden, some medical records, travel ideas, book & movie recommendations, and more. At one point in my life these were all things that were "save worthy". Three hours later I had purged a giant garbage bag with papers from my past--all ready for the recycling dumpster! And, yes, I saved what was worth saving. I already knew I was committed to this plant-based no-oil lifestyle without needing to purge any recipes from my past. My pantry has long ago been purged of junk. I've been eating plant-based for 3 1/2 years now. No-added-oil for 13 months. It feels like how I've always eaten. It's normal. It's routine. But, ditching my recipes & cookbooks feels like drawing a line in the sand. Like throwing out clothes that no longer fit. Or making your kitchen officially Kosher. It's saying, "This is me, now. I'm not the same person that I used to be. This isn't a fad. It's no longer just an experiment. Sure, I'm open to tweaking--but oil, dairy, meat... I don't think so! All those saved newspaper/magazine/internet/photocopied/hand-written recipes for cookies, cakes, chicken, beef, and casseroles...GONE! All the cookbooks I no longer use--The Barefood Contessa's, Rachel Ray's, The Silver Palate--banished to the basement bookshelf. Donate to the library? To friends? It was a no-brainer. I had no regrets or second thoughts. I can't imagine making anything anymore with shortening, butter, oil, eggs, cheese, cream, meat, or poultry. Surprisingly, there were plenty of recipes worth saving. Some I had long forgotten about, that can be easily tweaked to go oil-free or dairy-free. It was nice to be reminded of them. Yes, I'm a sentimental softy, at heart. There's a whole history of recipes from the special people in my life that lives in my Pink Flowered Recipe Notebook. They're yellowed with age. They're grease-splattered. Some are hard to read. Plenty are written in the handwriting of those special people. They're "forever keepers". Of course, I saved all of those. She was making this in her kitchen on the day we first met--1970. I was listening to Senator Sherrod Brown on the radio as I was busily sorting through the piles on my kitchen island. Brown happened to mention his wife, Connie Schultz, had just celebrated a birthday. Connie's a Pulitzer Prize winning journalist, who's a favorite of mine. She's smart, funny, & has chutzpah. She's not afraid to tell-it-as-she-sees-it! Click here for a Connie Schultz, I-can't-believe-this-is-really-true story post. How strange that I had just uncovered a copy of a yellowed Plain Dealer magazine page with a poem she had written almost 10 years ago. Update: I just re-read my Connie Schultz post--hadn't read it since I wrote it in 2008. Gotta say--the story about Jane left tears in my eyes & gave me chills. You see, Jane's grandmother just happens to be my mom! And, here's another coincidental twist to all of this--I also remembered that I had tucked a copy of Connie's poem into Jane's college graduation card. The rest of the story....she's graduated with a Dr. of Physical Therapy in 2010 and she's doing just fine! We think we have all the time in the world. Speak our mind, say we're sorry and make it right. And declare this one here is mine. the perfect moment right in front of us. Quietly beckoning us to seize its promise. Connie's poem wasn't the only piece of buried treasure that I rediscovered on the Kitchen Island yesterday--and decided to save. There were other gold nuggets that I saved, put away, only to rediscover again, the next time I go on a paper purge. At dinner last night I told my friend Joyce about my recipe purge. Turns out--she did the exact same thing 2 weeks ago. Dumping all the recipes & cookbooks that no longer fit with the way she now cooks. Help! Does anyone have some practical advice on how best to save papers & scraps of useful "orphaned" info--so it can be easily retrieved--not buried alive? Please Share! Any tips for creating useful retrievable files--that don't turn into "another way station before going into the trash"? How do you keep track of what you file/put away? Remember birthdays: it guarantees that you get in touch at least once a year. -Gretchen Rubin, author & blogger "The Happiness Project"
No doubt about it. I'm a work in progress. I try this--I try that--I get rid of this--I forget about that--I see how this works--how that doesn't work--and I keep trying until I get it right. The "birthday/anniversary remembrance project" has had a long slow learning curve. Anyway, I used to be awful about sending out cards for birthdays & anniversaries. Which is a real stupid way to be, because I LOVE TO GET CARDS!! Then it finally dawned on me. I NEED A WAY TO REMEMBER BIRTHDAYS & ANNIVERSARIES SO I CAN SEND OUT CARDS! You'd laugh if you saw my scribbly, scrawly tiny birthday calendar that's in my 15 year old Day Runner planner--that I only keep around for that one tattered birthday calendar page. I'm a real slow learner. The system works well if I remember to look at the calendar ahead of time, so I can actually buy a card and send it out before someone's birthday or anniversary has passed--but I don't look at it often enough. And usually too late. It was a pretty stupid system. Use Google Calendar! For a brief recent review of the calendar click here. I started using Google Calendar a couple of months ago for appointments, events & things I needed to remember. It's best feature is its email or pop-up reminders that you set according to your preferences--minutes--hours--days ahead. It took me about 1 hour to enter every niece, nephew, brother-in-law, friend, neighbor, co-worker, relative or significant others' birthday and anniversary. This one time set-up will be automatically repeated FOREVER (that's how you need to set it up!) --or until Google disappears off the face of the planet. Use Google notifications (reminders) for every birthday or anniversary you enter. This is absolutely the best part of Google calendar. You can preset your calendar to send you an email reminder, or a pop-up reminder whenever you specify. I set my notifications to send me an email reminder 1 week before a birthday so I can buy the card & mail it out. Once I get the email reminder, I keep it "unread" in my Google mail box until the birthday arrives, just so I don't forget the special day. I repeat-You do it once & it's forever: You can easily set up all your birthday-anniversary reminders ONE TIME ONLY, & set them to repeat every year, forever! I love that feature. Tip #1- Change the Notification setting default: Before you start to set up birthday reminders, look to the left-hand side of the Google calendar screen, under the little Monthly calendar--find the link to "settings". Click on it & then look for the link to "Notifications" in the upper right-side of the new screen. You can preset all your birthday notifications to be the same & it will save you from having to change each entry, separately. In my case, I set up my reminders to come as "Emails" 7 days before the event. When you are all done, then you can go back & change the Notifications settings to something else, that will be more useful in your regular use of your calendar. As in all instructions--you'll see what I mean when you actually do it! Last tip-Enter birthdays on top: When setting up birthday/anniversary reminders, enter the info on the TOP light blue strip of the calendar page, not within the time-slots. You'll know you're in the right place because there will be a little note that says: e.g. Mom's birthday. Why GMAIL & Google Calendar Rule! I know I will keep my GMAIL account for a long time to come, so I don't have to waste time using some fly-by-night computer birthday service that may go out of business, nor am I concerned about a change in my email address. There's nothing wrong with having a GMAIL account, along with any work, hotmail or yahoo accounts! You may even prefer it. You can access your Google calendar & GMAIL wherever you are. It's so easy. I'm definitely not a Google Calendar maven, but I found the whole process very easy to do. Take the tour first. I highly recommend you take a look at the Google Calendar tour to get started. Email me if you have a question--I'll help if I can. Remembering birthdays & anniversaries is one of the easiest ways to make you & everyone else happy! calendar with just a couple clicks. View calendars that others have shared with you, and let your friends and family see your agenda. Never forget another event again. You can even get reminders sent right to your mobile phone. Calendar Sharing: Set up a calendar for your company softball team, and share it with the whole roster. (Your shortstop will never forget about practice again.) Or share with friends and family so you can view each other's schedules side by side. Invitations: Create event invitations, send them to friends, and keep track of people's responses and comments, all in one place. 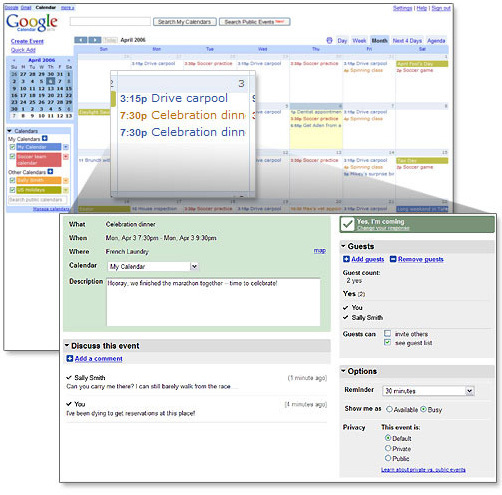 Your friends can receive your invitation and post responses even if they don't use Google Calendar themselves. Quick Add: Click anywhere on your calendar where an event belongs (or use the Quick Add link), and start typing. Google Calendar understands whole phrases like "Brunch with mom at Java Cafe 11am on Saturday," and will pop new events right into your agenda. Gmail Integration: Add your friend's Super Bowl party to your calendar without ever leaving your Gmail inbox. Gmail now recognizes events mentioned in emails. Search: Find the date of the Baxter family BBQ (you knew it was sometime this summer). Or, search public calendars to discover new events you're interested in and add them to your own calendar. Event Publishing: Share your organization's events with the world. Learn more with our Event Publisher Guide. Languages: The interface is currently available in English, French, Italian, German, Spanish, Danish, Dutch, Norwegian, Finnish, Swedish, Russian, Chinese-Simplified, Chinese-Traditional, Korean, Japanese, Portuguese and Polish. You can enter calendar information in many other languages, too. If you already have a Google Account, just visit the Google Calendar homepage, enter your username and password, and click "Sign in." If you don't yet have an account, you can create one now. Does Google Calendar connect to other calendar applications and devices? Can I import events from Microsoft Outlook or other calendar programs? Can I set limits on the info I share with others? Yes. You control how much you share, and who you share it with. For instance, you can let Aunt Jane see details about your ballet recitals but not your Lambada lessons. Friends and organizations can share their calendar info with you, too, and you can view it alongside your own agenda. What about privacy? Will Google share my information? I have more specific questions about using Google Calendar. What should I do? Please visit the Google Calendar Help Center. "If you're anything like me, you do more than passively observe the surroundings when you enter someone's living space for the first time. My research focuses on how people's possessions can tell us even more about their personalities than face-to-face meetings or, sometimes, what their best friends say about them." Dr. Gosling has been looking under beds, peering into closets & rifling through music collections, all in the name of research, for almost 10 years. He claims he can figure out a lot about you, especially by looking at your bedroom. At first this made me kind of uneasy. Uh, what would the piles of books and magazines all over my house say about me? And what about my choice of pictures on my book shelves, the open bottle of wine, the bowls of fruit and vegetables, the bottles of vitamins, receipts, and other junk on top of my kitchen counters? I heard Sam on NPR on the way home from Chicago & yesterday I read all I could about his research. His new book, Snoop: What Your Stuff Says About You, is about to hit the bookstore shelves. I'm a sucker for personality profiles, so I had to know more. The good news, at least for me: Clutter isn't so bad! It can mean you're creative & open to new ideas & experiences! Sam can typecast you by your taste in music, what your office looks like, what's in your bedroom, what's on your walls, and what kind of junk just happens to be lying around your house. "My research team went into bedrooms and offices and recorded their impressions in standard personality tests. We then compared what they thought about the occupants with what the occupants thought about themselves and what their friends thought about them." Gosling says that the more he peers into people's personal spaces -their homes & offices- "The more I've come to believe that what's going on outside the mind, reflects what's going on inside the mind." Our living spaces shout to the world who we are. They're an IDENTITY STATEMENT. We decorate to please ourselves. We pick colors, pictures, and memorabilia that give our space the "Stamp of Us". Our stuff shows what we value and how we view ourselves. What we hang on our walls, what books we prominently display, reflects how we want others to view us. We leave out what we don't want to show people. We hide the stuff we want hidden in our closets & drawers. Our "stuff" tells the world what we do in our homes. Whether we listen to folk music, garden, watch lots of TV, drink single malt Scotch, collect Israeli stamps, read World War II history or entertain others--it's in our "stuff". Our "stuff" also tells the world what we do outside of our homes. Check out the receipts for plane tickets, sports or concert programs, athletic shoes, garage sale finds, or the invitations & appointments hanging on the refrigerator. And then there's our character. Our "stuff" gives big clues as to how we rate in the "BIG FIVE" personality traits: openness, conscientiousness, extroversion, agreeableness, and emotional stability. But, in the final analysis, our "stuff" says more about how open we are to new experiences and how conscientious & organized we are, than it does about the other traits. Are you organized or on the messy side? This doesn't mean exactly what you might think it means. According to Gosling, "You may want your lawyer to be very organized and have a clean desk, but if you are meeting with someone in advertising, you would want their desk to be covered in papers and ideas that represent their ability to be creative." Are you open to new experiences or are you reserved and conventional? A diverse collection of books & magazines, original art, and souvenirs reflects someone who's open to new things. It's not the quantity that's important, but the diversity! Does your CD collection have rock, jazz & classical, or are you just collecting Country? Openness was correlated with curiosity, imagination, being unconventional and having a wide variety of interests. A labeled CD collection, books arranged by subject, & nothing on flat surfaces---of course this means organization, but it also means conscientiousness. To have an organized living space it's not sufficient to just organize it one time. It means consistently putting the phone book back on the shelf, throwing away the newspapers, and hanging up the clothes. Interestingly, the conscientious folks did not make particularly good use of the space in their offices. Go figure? Conscientiousness=order=efficiency=self-discipline. Are you an extrovert or an introvert? This trait is easiest to determine in an office, rather than a home. The extrovert wants to lure people into her office to chat & schmooze. She'll have a comfortable chair, an open door, maybe a jar of jelly beans, and the office will be decorated with pictures and lamps. The introvert's office will have subtle "no visitors please" clues. A hard chair, and no decorating to speak of. Forget about the candy. For the most part, our stuff will not show whether we are agreeable, good-natured, emotionally stable, neurotic or bad-tempered. But, some research indicates that agreeableness is associated with rooms that are cheerful, colorful, clean, organized, neat, comfortable, inviting, with no clothes strewn about! Folk wisdom holds that pleasant people occupy pleasant rooms, and agreeable people are concerned with the aesthetic comfort of their visitors. Sounds like the house of someone I'd want to visit! Lots of color, brightness and a well-lit room reflects someone who is kind, open and sympathetic. Lots of souvenirs & memorabilia? You're sentimental. Are you a collector or a hoarder? Hoarders collect everything, can't throw anything away, and this causes them much anxiety. Collectors, on the other hand, take much pleasure from what they collect. They also are much higher in the BIG FIVE TRAIT of conscientiousness. They're orderly, organized & on the ball! We are not very good judges of how organized we are. Everyone has different standards for organization & neatness. 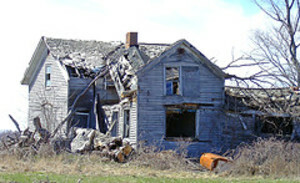 Did a friend ever tell you to please excuse the huge mess in her house, only to walk into a pristine showplace? For some people a glass in the sink is a mess. For another a mess looks like something "a cyclone just hit". Dr. Gosling suggests you ask your friends how organized you are, to learn the truth. "They know if you're someone who has a spare stamp, or if your someone that they need to preschedule 30 minutes ahead for a movie, because they're tired of always waiting for you. Country, Top 40, "easy listening"? They're conventional, honest, & conservative. So what does all this have to do with being happy, healthy, and living a long life? Heck if I know. It's just fun & interesting to play detective, both in other people's houses and our own. I think we're all a little blind-sided about how we look to the world. A couple of months ago I was surprised to hear a friend describe me as someone who lives pretty modestly. Yes, I guess it's true, but I never thought it was noticeable. "It almost seems as if making your bed everyday and keeping your life in order is futile. In a sense it is. Every time you try to organize, you’re battling a natural force that drives the entire universe: entropy." I woke up at 3:00 in the morning consumed with thoughts of entropy--that left to its own devices everything (like my house, my garden, my body & my brain) just falls apart --there are only 24 hours in a day--the maintenance never ends--and now I'm adding some extras to my To-Do List for this month--HOW CAN I GET IT ALL DONE? Replacing our 20 year old air conditioner that just died. Fixing my car, now that the Check Engine Light can no longer be ignored. Reading a book for book club. A Good Thing. Hosting the book club. A Good Thing. Rehanging the pictures I removed 1 year ago when we painted our house-that I haven't rehung because I wanted something hipper than what's been hanging there for over 20 years, and I don't exactly know what that is. Cleaning out my disgusting basement. Finally getting started on redoing my oldie moldy upstairs bathroom. Replacing the faded, worn-out family room furniture. I know-this is definitely a case of whining on the yacht! Why am I moaning? Children in Haiti are eating mud sandwiches, people are starving in Myanmar, and now the earthquake in China. And I'm whining about having too many wonderful things to do? And then, by chance at breakfast, I happened upon Benjamin Franklin and his own sorry struggles with bringing order into his life. He had far more important things to accomplish than I, and yet all the household stuff drove him crazy, too. That's when I had a brilliant revelation. Maybe there's a connection between an orderly life and a happy accomplished life. If I want to fully enjoy my family, my friends, my projects, and actually do something about Haiti or Myanmar or the environment---maybe I need ORDER IN MY OWN HOUSE FIRST. Franklin chose Order as his third virtue because it “would allow [him] more time for attending to [his] projects and [his] studies.” Franklin understood that if he wanted to get important things done in his life, he had to make sure the little things wouldn’t get in the way. From the website: The Art of Manliness comes advice for people like me, who hate planners and systems, but need a nudge to get going. The secret to bringing order to your life and overcoming entropy while only minimally increasing it in other areas of your life is simple: DO IT NOW. No system, no in-boxes, no index cards. Just do it now. After you get out of bed, turn around and make it. After you receive a piece of mail, take action on it immediately. As soon as you’re done eating, wipe down the kitchen. If you drop a sock on the floor, pick it up without hesitation. It’s not as easy as it sounds because whenever a bit of disorder appears in your life, you will feel entropy pulling you to ignore it. You must train yourself to repeat the mantra “do it now!” and push through this force. If you find that you can’t do something now, write it down in a simple notebook. There’s no need to develop an elaborate capturing and filing system. Just write it down so you don’t forget. But what about tasks that require multiple steps, ones you can’t take action on immediately? You will get to them eventually. They’re big; you won’t forget to do them, and you don’t need a system to get them done. Meanwhile, by creating an organized home, car, and workplace, you create an environment out of which the bigger tasks will flow far more easily. Long before the “7 Habits of Highly Effective People” and “Getting Things Done,” men like Theodore Roosevelt accomplished amazing things without an elaborate system. You don’t need to set up some crazy regimen either. All you need to know to become a Master of the Universe are three little words: do it now, dagnabit. Okay four words. I left the house this morning with my bed made, my clothes hung up, the sink empty, and everything picked up. It added about 12 more minutes to my morning. Who knew? I can do this.